Tickets $30.00 — Early Bird Gen Admiss. $30.00 - $50.00 — Gen Admiss. 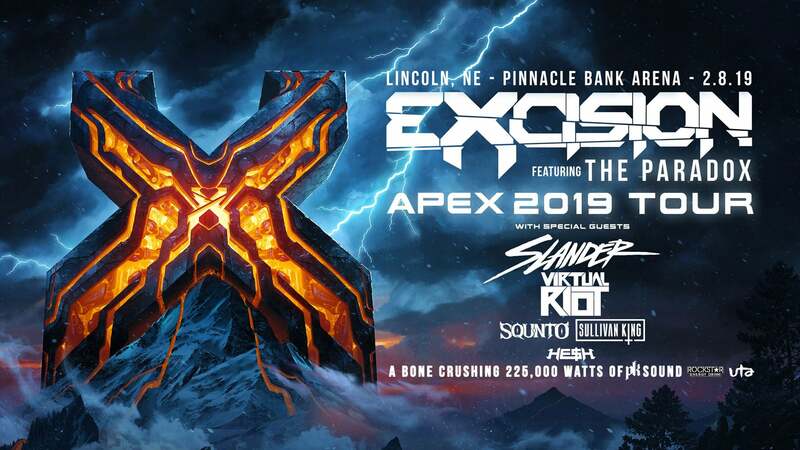 Ever since the release of Excision‘s album Apex, headbangers have been anxiously awaiting the Apex Tour and it’s finally here. Coming to Lincoln on February 8 and hitting over 30 cities across the U.S. from New York to San Bernardino and everywhere in between. The Apex 2019 Tour with special guests Slander and Virtual Riot is bound to bring the fire to each and every stop. With massive support from dubstep heavyweights SQUNTO, He$h, and Sullivan King, attendees can expect hours upon hours of the wildest bass imaginable before Excision even takes the stage. The best part about seeing Excision on tour is getting the full-on Paradox experience, complete with earth-shattering PK Sound. There’s nothing quite like his vibrant, mesmerizing robotic and Prehistoric inspired visuals taking you on a journey of filthy dubstep drops. Along with some ferocious dinos, headbangers can also expect other classic characters from The Paradox like Robo Kitty and Harambe to grace their visual experience. Excision has truly solidified his place at the top in the dubstep world recently, having himself an absolutely huge year headlining festivals left and right, hosting another massively successful edition of Lost Lands, and even adding another Excision-owned festival to his repertoire, Bass Canyon. Not to mention, his tracks like “Rumble” and “Hoods Up” grace almost every bass set imaginable to the joy of headbangers everywhere. Considering all of this success and more, you absolutely do not want to miss out on the Apex 2019 Tour!